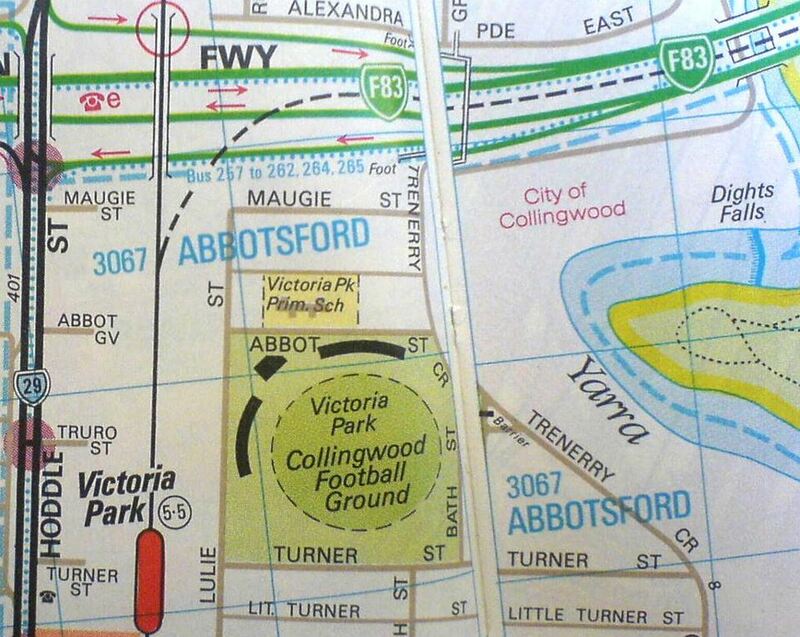 Image: Down Memory Lane we go, Melways Edition 14, showing the proposed Doncaster train line from Victoria Park. The line eventually disappeared from later Melway editions. The Doncaster railway line is a proposed suburban railway in the eastern suburbs of Melbourne, Victoria, Australia. Connecting to the existing Melbourne metro railway network at Victoria Park station on the South Morang and Hurstbridge lines; the Doncaster line would have served the suburbs of Bulleen, Templestowe and Doncaster; running both in the median strip of the Eastern Freeway and in a tunnel under houses. Initial works commenced in 1974 but the project was cancelled in 1976. First proposed in 1890, detailed planning commenced in 1969, and by 1972 the route was decided upon. Despite rising costs, the state governments of the period continued to make assurances that the line would be built. Property acquisition for part of the route was completed in 1975, and construction of a cutting at the city end commenced in 1974, only to be filled in two years later. By 1982 plans to build the line had been shelved by the state government, and by 1984 land for the line once it left the freeway had been sold. In 1991 an independent report investigated constructing the line, recommending against it due to the high cost.However several other reports released since the 1970s detail the essential requirement for heavy rail mass transit in the Doncaster corridor. The Doncaster rail line proposal is almost identical to the earlier completed Joondalup Line and recently completed Mandurah Line, both in Perth, a city with less than half the population of Melbourne, which runs along the centre median of the Kwinana Freeway and through various tunnels. The Mandurah rail line, completed in 2007, is almost double the length of the proposed Doncaster line and cost 1.6 billion; trains are able to travel at up to 130 km/h. Despite the massive requirement, local council and public pressure, there remains no firm state government commitment to build the Doncaster line. The rail line proposal resurfaced during the Northern Corridor Study. Its 2003 report found that mass transit to Doncaster, together with other initiatives consistent with the still new Melbourne 2030 plan, would make the road tunnel unnecessary. Northern Central City Corridor (NCCC) Strategy, Draft (and Final) Report August 2003, Department of Infrastructure. A light rail or busway solution would run from a new underground bus/tram interchange at Doncaster Hill, in a dedicated right of way along Doncaster Road, then in the median of the Eastern Freeway from Doncaster Road to Alexandra Parade, requiring widening of the Freeway from Bulleen Road to Doncaster Road. From there, it would run along Alexandra Parade (in a dedicated right of way, and probably taking a traffic lane in each direction) to Nicholson Street, where it would join tram route 96 into the City … another option would be to turn into Elgin Street and Swanston Street to serve Melbourne University more directly, then into the city along Swanston Street. High-speed vehicles would be used to provide competitive overall journey times compared with car travel (and also to travel along the freeway at noticeably higher speeds than cars). A heavy rail solution would run underground from Doncaster Hill to the Eastern Freeway at Bulleen Road, following the freeway median from there to the Clifton Hill railway overpass. At this point it would turn south, leaving the median to join the Clifton Hill line north of Victoria Park station. Doncaster train services would then enter the city using the city loop (service patterns would need to be worked up in detail). With all options, the primary objective would be to provide a competitive edge, with shorter overall journey times than car travel, and much-improved reliability, capacity and passenger amenity than the present bus services. This means that DART will need to be fully segregated from road traffic throughout its length. An integral part of DART would be the redesign of bus services in the Doncaster corridor to improve their coverage and provide effective feeder services to and from the rapid transit system, including an effective bus/DART passenger interchange at Doncaster Hill. Before any commitment is made to DART, a full feasibility study is needed into the options available, the potential benefits and costs. In the meantime, any land needed for future options should be protected.